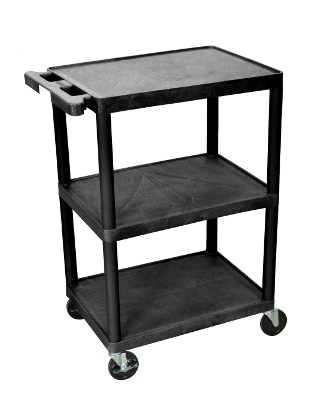 These Luxor HE series utility carts are made of high density polyethylene structural foam molded plastic shelves and legs that won't stain, scratch, dent or rust. Clearance between shelves is 11 3/4"
Optional surge suppressing electrical assembly has 3-outlets 360 degree swivel cord wrap that attaches to the leg of your choice. HE series has optional 2 or 3 shelf units with a variety of height selections and 2 shelf size options. Easy assembly. Made in USA.